The Seattle Bicycle Expo, a two-day consumer bicycle expo produced by the Cascade Bicycle Club (www.cascade.org/expo), is scheduled for Saturday, March 12 and Sunday, March 13, 2011. In 2010, local and national exhibitors from the United States and Canada filled more than 250 booths, welcoming thousands of bicycle enthusiasts. The 2011 Seattle Bicycle Expo will be held again in the deluxe, newly-constructed, two-story Smith Cove Cruise Terminal, which overlooks the Puget Sound and features a magnificent view of downtown Seattle and the Olympic Mountain range. 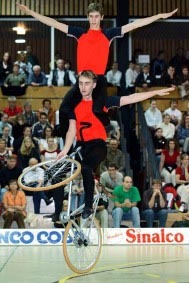 During the 2010 show, Universal Sports hosted a Giro d'Italia viewing lounge, more than 120 bicycles were on display in the Classic Bike Show, and the main performance stage showcased three world-champion artistic cyclists from Germany and the always-popular stunt show by Ryan Leech. We are pleased to announce that Cascade Bicycle Club has secured a multi-year contract that will guarantee the Smith Cove venue for the next few years. During the weekend, nearly 8,000 cycling enthusiasts are expected to shop, attend seminars, meet industry representatives, watch performances and gear up for another season of cycling. For exhibitor and sponsorship inquiries and general information, please call Mike Inocencio at 206.522.2403 or email mikei@cascadebicycleclub.org.